If you’ve been an Apple fan for the past year, you already know the somewhat controversial decision they made with their newest Macbook Pro lineup. 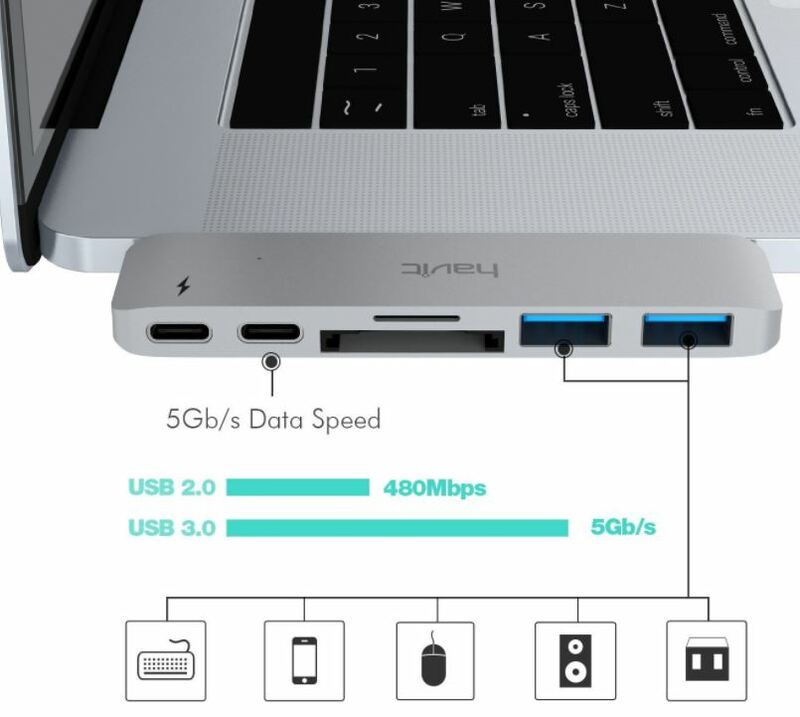 In pursuit of a more simplistic design, Apple decided to go-away with the variety of connections, in favor of four Thunderbolt 3 (USB-C) ports that are capable of “doing it all”. From charging the internal battery, connecting multiple monitors, to transferring massive amounts of data, this is the new standard. However, you’ll likely need an adapter for a lot of connections, as many of today’s peripherals still rely on outdated input/output types. Rather than stocking up on various adapters, many Macbook owners are deciding that a dock or hub is a better approach. By incorporating many connections into a single device, you have less to hold onto, and an easier way to adapt to a variety of connections. 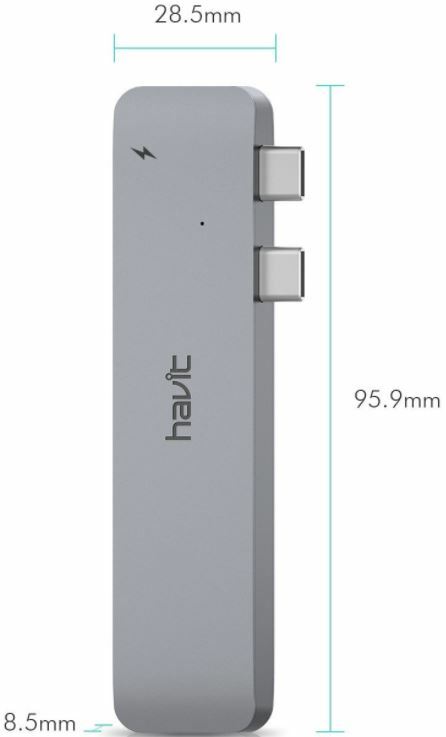 HAVIT, a popular, budget-friendly manufacturer recently released the T90. It’s a Thunderbolt 3 dock/hub that’s specifically designed for the 2016 Macbook Pro or later. In fact, it’s even available in the exact same color scheme as the newer Macbook (space gray). We were invited to try it out for ourselves and look at it from an in-depth yet unbiased and fair point of view. We’ll look at the build quality, what it offers and take a look at all of its exciting features. Opening up the box for the first time, you’ll notice a couple of pieces of literature are included – a “tell us your thoughts” pamphlet and the user manual. These give you a quick insight into the T90 and list the technical specifications, product details and other remarks. By taking a glance at the HAVIT T90 Thunderbolt 3 Dock, you’ll notice a slim and minimalist design – just like the Macbook Pro itself. 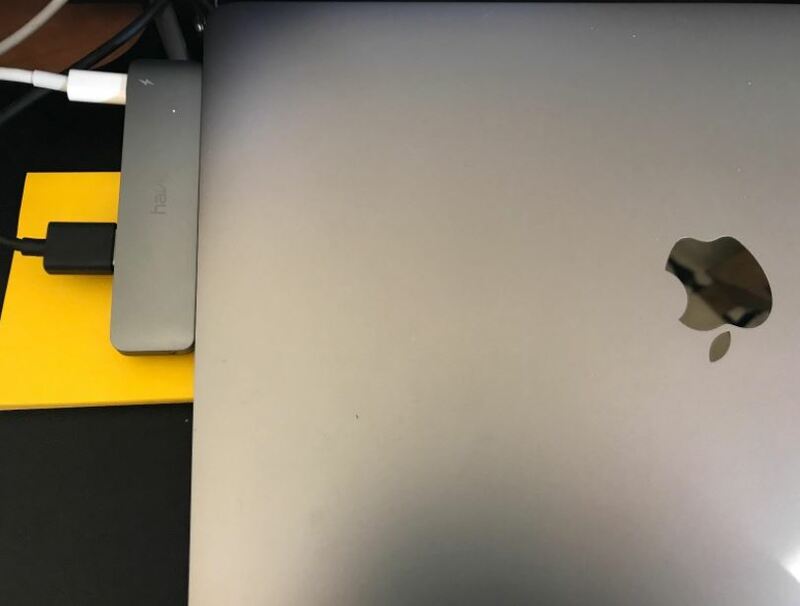 Available in Space Gray, it matches the Macbook spot-on, making it appear naturally when connected to the side. Measuring just 9.59 x 2.85 x 0.85 centimeters, it’s comprised of an aluminum-alloy shell that boasts a polished and nearly “cold to the touch” feel. While it looks good, the material they choose also works hand-in-hand with keeping everything running cool. Naturally made to dissipate heat, HAVIT did well by taking this approach. Getting started with the T90 is pretty straightforward. Located on the side are two USB-C male connections that you plug-in directly to the left side of the Macbook. The plug-and-play design allows for a quick setup with no need to install any special drivers or software. Just slide it into the USB-C ports and you’re good to go. Taking a look further, you’ll notice that there are a multitude of ports on the hub. This includes one Thunderbolt 3, one USB-C 3.0, two USB-A 3.0, and an SD/Micro SD port. 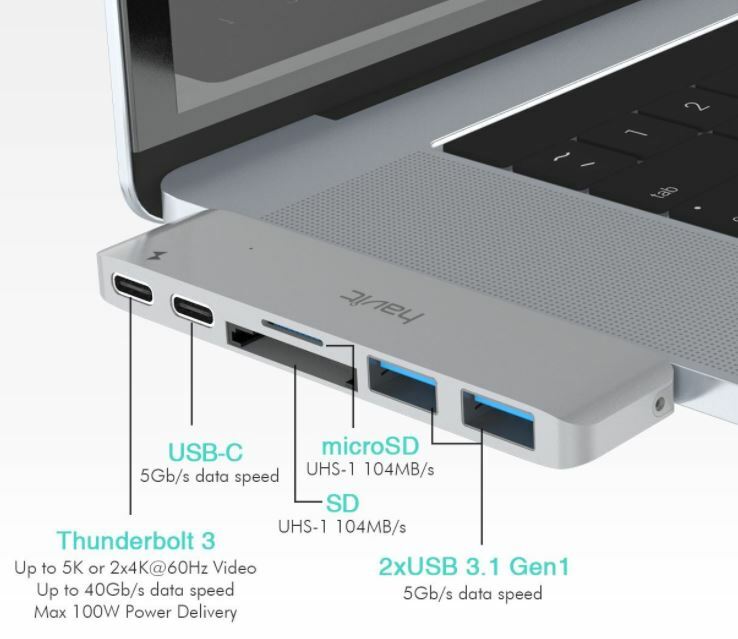 Each one is an expansion of your Macbook, by allowing you to connect more than just USB-C compatible devices. 1 x Thunderbolt 3 Port – Capable of reaching transfer rates of up to 40 Gb/s with support for 5K resolution or 2 x 4k at 60 Hz. This allows you to expand your screen and daisy chain additional monitors if you’d like more visual real estate. Supports PD charging. 1 x USB-C 3.0 Port – The second USB-C input offers speed up to 5 GB/s but doesn’t support charging. 2 x USB 3.0 Ports – Ideal for those who need support for older, USB 3.0 and 2.0 peripherals or devices. Allowing speeds up to 5 GB/s, these two ports open up a wide range of expansion. 1 x SD and Micro SD (SDHC 3.0) Inputs – A quick and easy way to instantly transfer data from memory cards. With speeds up to 104 MB/s, it’s ideal for photographers and filmmakers who typically use these. We found the usage of these connections to work quite well. Everything was “Plug and Play” as described earlier, and the transfer rates seemed to be quite accurate. It was nice to see that there were no errors or communication issues between the Macbook and the Hub. Whenever your Macbook is transferring large files or expanding its display to an external monitor, things can heat up. So much so that many manufacturers need to take heat dissipation into consideration. Luckily, HAVIT designed the T90 with an aluminum alloy shell. It has the same cold-to-the-touch feel that the Macbook has, and blends perfectly into the Space Gray style. We utilized the Thunderbolt 3 port for 5 continuous hours to mirror the display of the Macbook onto our 34 inch 4k monitor. In those 5 hours, we did a bit of everything in order to test if heat was an actual problem. Online gaming, streaming a Netflix movie and doing a bit of Photoshop editing gave us a clear indication as to how it holds up. The hub never seemed hot to the touch – only a bit warm, which is understandable with the amount of use we put it through. We think that the precautions HAVIT took with designing it around heat-protection was a smart approach. Although we’re pleased with how the HAVIT T90 works, there are a few things that must be noted. The SD and Micro SD inputs cannot be used simultaneously. Although not a big issue for most, it may become a problem if you’re someone who wants to use the hub solely for transferring data via memory cards. Furthermore, we would have loved to see an HDMI out port on the dock/hub. Most televisions and displays still require an HDMI connection, and so many individuals love to put their Macbook display onto their HDTV. In addition, the T90 only works with the latest Macbook pro models – the 2016 or later version. It’s not compatible with any other laptop or older Macbook, but this is obviously because no earlier version supports Thunderbolt 3. Although it’s sleek and trendy that Apple decided to ditch the various ports on their latest Macbooks, it’s nice to see devices like this exist. Not all of us can be happy with only a USB-C connection, especially when most devices connect in different ways. 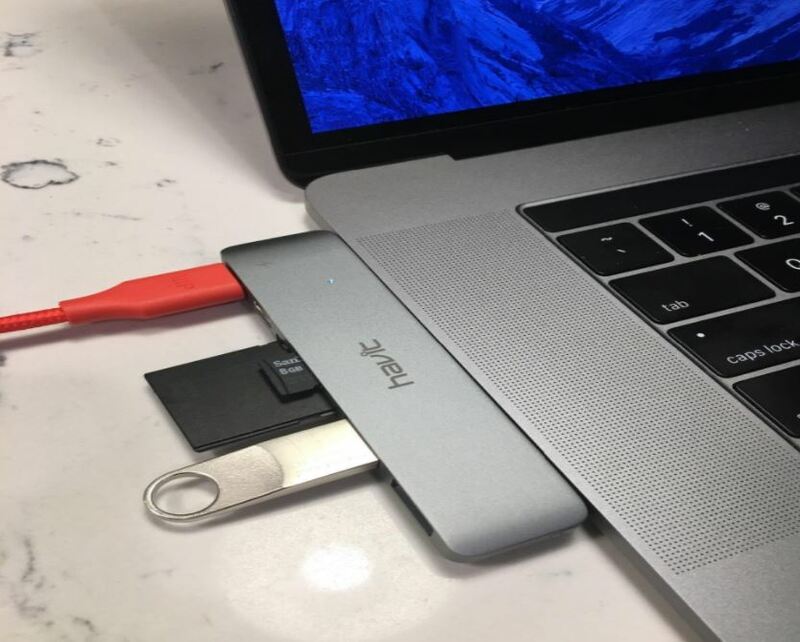 Although you may be able to load-up on a wide range of Macbook USB-C adapters, nobody likes keeping track of an assortment of extras like these. 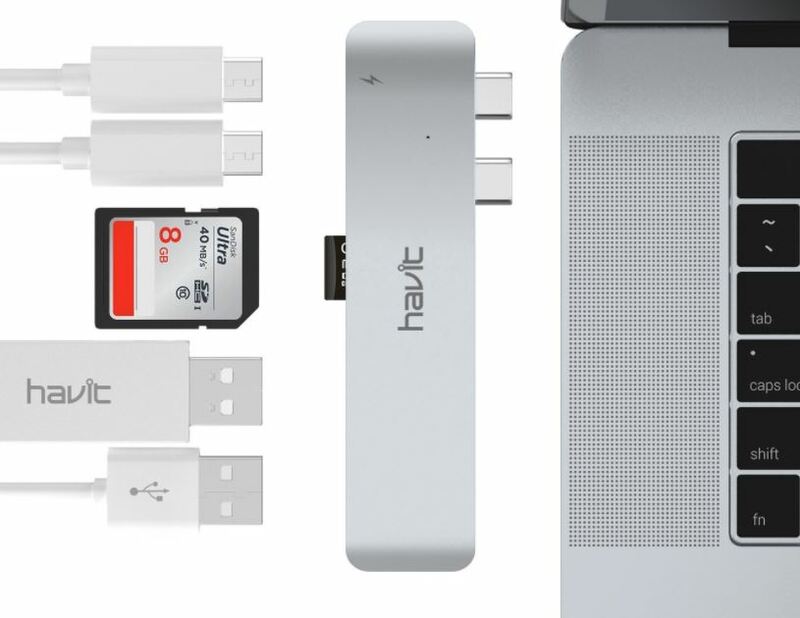 Having an all-in-one solution like the HAVIT T90 Thunderbolt 3 Dock/Hub is a smart choice. Boasting the same slick-appearance as the Space Gray Macbook, it blends right in and looks sharp. The build-quality seems up to par and the compact size of it makes it an easy addition to the briefcase or small pocket. Best of all, the T90 is protected by a full 12-month manufacturer’s warranty period should you ever have any problems with it in the future. Additionally, there’s a 30-day money back guarantee if you’re not happy with it.